HumanWare has announced that its Victor Reader Stratus M multi-media accessible audio book player is now shipping. The Stratus M has reading capabilities beyond just listening to recorded books and music. It can also play text books and documents in formats such as BRF, DOCX, HTML, RTF, and TXT with high quality computer voices from Acapela . Victor Reader Stratus M claims superb fidelity for a loud built-in speaker, with a pronounced audio tone control, variable speed playback control, built-in carrying handle, and rechargeable battery. Users can also directly copy CD DAISY books to an SD card without use of a computer. The Stratus can play both DAISY recorded and DAISY text books from most DAISY libraries around the world. In the United States this includes books from NLS, Learning Ally, and Bookshare. 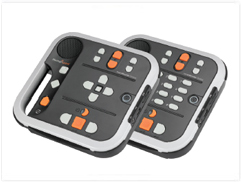 The Stratus4 M model features a simple 4-arrow keypad providing sequential navigation such as next/previous chapter, section, page, line, sentence, word, and character. In addition to sequential navigation, the Stratus12M model has a 12-key telephone style number pad allowing direct navigation such as “go to Page” and “Go to heading”. The keypad is described as having high contrast keys, well spaced, with tactile features, with all key presses returning audio feedback for the non-sighted user.